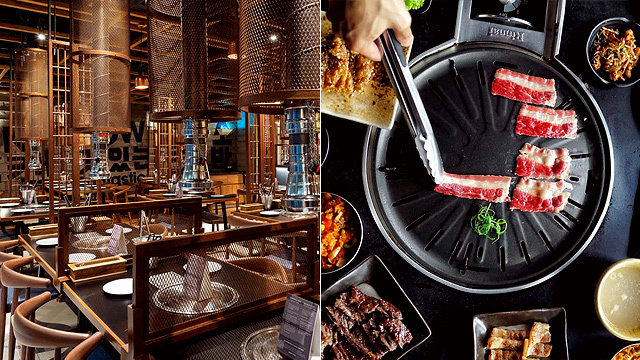 Our love for Korean barbecue is not going anywhere anytime soon, and how quickly Manila's KBBQ chains open up isn't helping at all. (Don't get us wrong, we're not complaining.) It's easy to get confused with all these joints—both old and new—that you now see all over the Metro. Starting to wonder what the difference is among all these Korean-barbecue places? Here's a quick rundown of where to go depending on what exactly you're craving (and how much your budget is, too!). 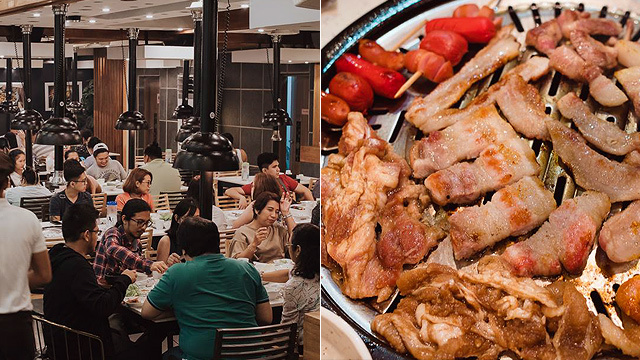 Samgyupsalamat was one of the first Korean barbecue chains in Manila—opening arguably before KBBQ was even a trend—in 2012. This chain now has over 30 branches in the Metro. You can have your fill of unlimited samgyupsal or pork belly for P399, but if you'd like beef as well, you can also opt for unlimited pork and beef for P499. Both sets come with all-you-can-eat sides and bottomless iced tea! Recently, the KBBQ chain also made waves when they finally added cheese fondue on their menu. 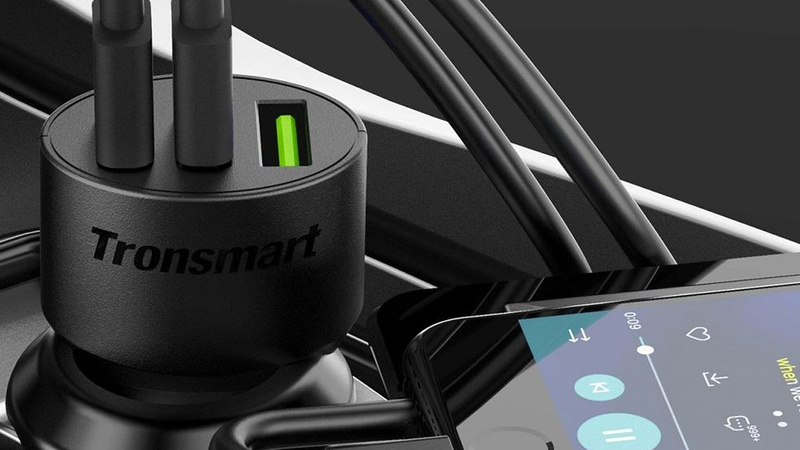 It looks like you have another reason to line up again. Opening only in 2017, Romantic Baboy is a relative newcomer in the KBBQ scene, but that hasn't stopped them from skyrocketing in popularity—and in quickly opening branches all over Metro Manila, too. Romantic Baboy became popular for offering Cheesy Samgyupsal or unlimited cheese fondue, but that isn't the only thing they have going for them. For only P499, you can get your unlimited fill of woo samgyup, moksal (pork neck meat), bulgogi, pork ribs, curry beef, and more. Romantic Baboy has pretty aggressive expansion plans—they're set to open four new branches in the first week of November alone—so expect to see the adorable, swankily dressed pig mascot in more places. See a list of Romantic Baboy branches. While not exactly a chain—they currently only have one spacious branch on Mother Ignacia Avenue—Fantastic Baka deserves a mention as they do get mixed up with Romantic Baboy a lot. Admittedly, they do have a lot in common: They both have suited-up animal mascots, and both offer unlimited Korean barbecue at pretty affordable prices. For P599, you can already get your unlimited fill of pork and beef cuts plus sides and an addictive cheese sauce, while P799 will get you more premium cuts like Beef Brisket and Prime Chuck Eye Roll. Fantastic Baka is helmed by Chef Jang Jung Yun, who has also headed Michelin-starred restaurants in Korea, so you can expect pretty fantastic, high-quality sides, too—their housemade kimchi is especially noteworthy. Fantastic Baka is at Grandia Building, Mother Ignacia Street, Diliman, Quezon City. If you aren't feeling ravenous enough for unlimited Korean barbecue but are still in the mood for grilled meat, Soban K-Town Grill is a reliable bet. They have BBQ Grill Sets for Solo, so you don't have to miss out on KBBQ even when you're dining by your lonesome—the Dak Galbi Solo Set (P325) with 120-grams of marinated chicken and unlimited banchan or sides is a great option. If you're dining with a group, you can opt for the Classic BBQ Combo Set (P2,000), which is good for three to four people and will get you beef belly, pork belly, and boneless fried chicken, along with unlimited japchae, kimchi fried rice, and gimbap or seaweed rice roll. Reading all that already got us drooling! Hotpot or barbecue? You can have both at Go! Kizip. Korean-barbecue options are the usuals like samgyupsal and bulgogi but they do come at the affordable rates of P599 for lunch and P699 for dinner—that includes meat, vegetables, and broth for your shabu-shabu, too. 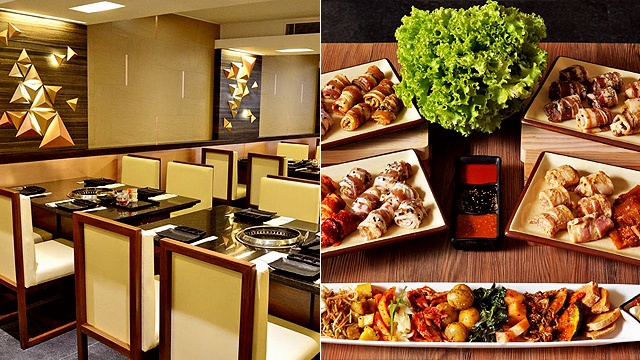 This rate comes with all-you-can-eat banchan though other branches tack on different freebies. We hear you can get free coffee, kimchi jigae, and bingsu at the Malate branch which is more than enough reason for us to drop by. Go! Kizip is at 1776 Adriatico Street, Malate, Manila; U/GF, CCTM Square, Tomas Morato Corner Timog Avenue, Sacred Heart, Quezon City; 2/F, UP Town Center, Katipunan Avenue, Diliman, Quezon City; and 789-791 Ongpin Street, Santa Cruz, Manila. 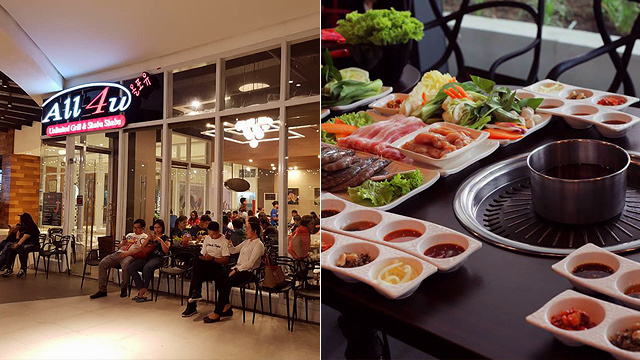 While not necessarily top-of-mind when you think of "Korean barbecue chains," Sambo Kojin is a reliable buffet place for casual parties and get-togethers. Pile your plate high with their selection of premium pork and beef cuts, which you can grill at the center of your table. You can also fill up on unlimited shabu-shabu, and other Korean and Japanese staples like tempura, sushi, katsu, gimbap, and more. See a list of Sambo Kojin branches. 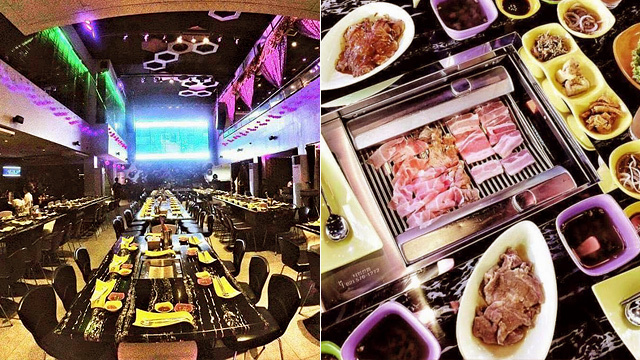 Hotpot and Korean barbecue also go hand-in-hand at ALL4U. 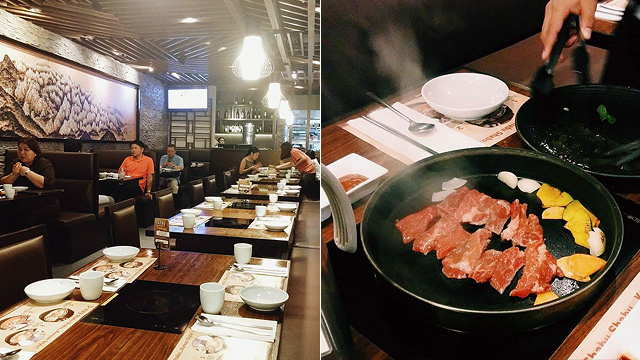 For P699, you get unlimited servings of pork, chicken, beef, and shrimp, which you can either cook on the grill or the hotpot, your choice of four different kinds of broth—Organic Shabu Shabu, Kimchi Soup, Bulgogi Soup, and Pork Galbi Soup—side dishes, ramyun noodles for your soup, and an ice pop to cap off your meal. You do get a lot of bang for your buck! See a list of ALL4U branches. 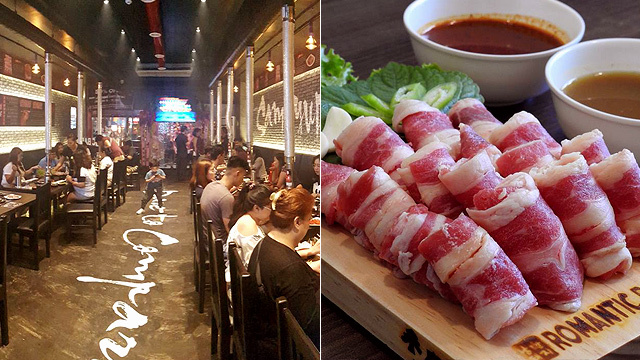 If you love K-Pop and Korean barbecue, funky K-Pub BBQ is the place for you! The restaurant features a spacious, neon-lit dining area with huge LCD screens that play K-Pop videos as you feast on unlimited pork and beef plus banchan. They also have huge framed photos of popular K-Pop groups, some of which are even autographed. They've got pretty much all the standards, from samgyupsal or pork belly and daeji kalbi or soy-garlic marinated pork to dak galbi or sweet-and-spicy chicken fillets. If you don't mind the rush, have the Eat And Run (P499+), which lets you grill all the meat you want for a maximum of one hour. But if you'd rather take your time, the No Limits, with no time limit and additional beef options, is still pretty budget-friendly at P899+. See a list of K-Pub BBQ branches. 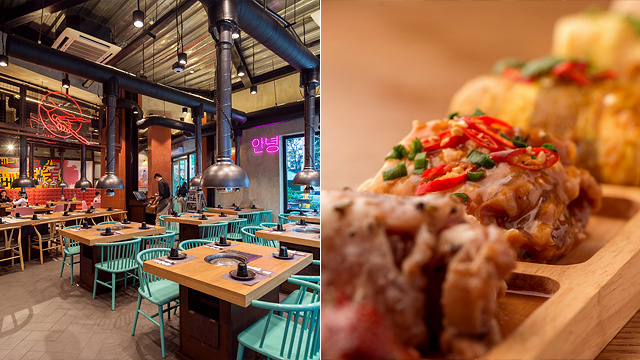 Hailing from South Korea, Bulgogi Brothers is also of the earlier players in the KBBQ game, arriving in Manila in 2011. Since then, they've opened four more branches around the Metro, all of which boast interiors that are more sophisticated than your usual casual Korean-barbecue joint. While they donât offer unlimited barbecue, they have a great variety of cuts: You can choose from KBBQ staples like Premium Pork Belly Barbecue (P595) and Beef Belly Barbecue (P495) to the more premium marinated Rib-Eye Steak (P1,195/10-oz, P1,395/12-oz). Dining with a group? The 6-Flavor Samgyupsal, with curry, ginseng, soybean, salt-and-pepper, garlic, and bulgogi marinades, should satisfy everyone. Banchan is unlimited but you can also order other Korean staples like the Seafood Pancake (P450) and Kimchi Stew (P425). See a list of Bulgogi Brothers branches. 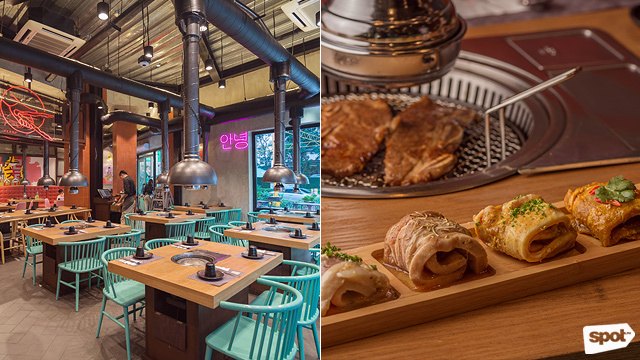 Budding Korean barbecue-chain Jin Joo seems to know exactly what the people want. Instagram-worthy interiors? Their pastel chairs, neon signs, and playful illustrations on an accent wall will have you snapping away. What about lots of gooey cheese? They've got that covered with the Cheese Deung Galbi (P950), or the Korean take on the American baby-back ribs which comes with shredded mozzarella and cheddar that turn into a delightfully stringy cheese dip; and the Fire Chicken with barbecue-glazed fire chicken, tteokbokki or sticky Korean rice cakes, onions, sweet potatoes, and lots of shredded mozzarella and cheddar. But the real star at Jin Joo is their Jin Joo's 8 Flavours (P1,560), which will get you samgyupsal or pork belly in eight different flavors that range from the pretty classic Smokey BBQ and Honey Garlic, to the more eccentric ones like Curry and Sweet Wine. 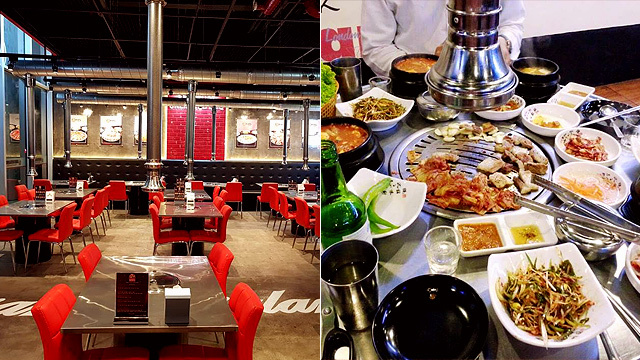 Jin Joo has unlimited Korean barbecue promos from time to time so watch for those! See a list of Jin Joo branches.